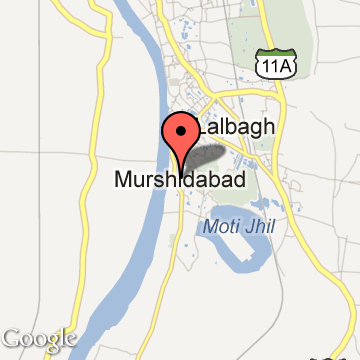 Murshidabad is a city in Murshidabad district of West Bengal state in India. The city of Murshidabad is located on the southern bank of the Bhagirathi, a distributary of the Ganges River.Earlier European spellings include Muxudavad, Murshedabud,Murshedebad and among others. Murshidabad was a town and district of British India, in the Bengal Presidency. In the Mughal period it was the capital of Bengal. Now The administrative headquarters of the district are at Baharampur. The town of Murshidabad is on the left bank of the Bhāgirathi-Hooghly or main sacred channel of the Ganges. Pop. (1901), 15,168. The city of Murshidabad was the last capital of Bengal before the British era. In 1704 the nawab Murshid Quli Khan changed the seat of government from Dhaka to Maksudabad, which he renamed after his own name. The family of Jagat Seth maintained their position as state bankers at Murshidabad from generation to generation. Even after the conquest of Bengal by the British, Murshidabad remained for some time the seat of administration. Warren Hastings removed the supreme civil and criminal courts to Calcutta in 1772, but in 1775 the latter court was brought back to Murshidabad again. In 1790, under Lord Cornwallis, the entire revenue and judicial staffs were moved to Calcutta. The town is still the residence of the nawab, who ranks as the first nobleman of the province with the style of Nawab Bahadur of Murshidabad, instead of Nawab Nazim of Bengal. The Hazarduari Palace, dating from 1837, is a magnificent building. The city still bears memories of Nawabs with other palaces, mosques, tombs, and gardens, and retains such industries as carving in ivory, gold and silver embroidery, and silk-weaving. An educational institution is named after Nawab family. Murshidabad Tourism - Get all information on Murshidabad tourist places and sightseeing tours. Our website helps you plan your next tour and gives you great ideas on what to do, where to eat, where to stay and when to go there. We give the best information from the web to give you precise, meaningful and useful travel guide for leading places to visit in India and from across the world. Our travel information on MURSHIDABAD tourist places, tourist attractions, major sightseeing, the best time to visit, the top places to visit in Murshidabad, the must-see things to see and do, maps, restaurants, hotels, nearby tourist destinations, local public information and more. To start with check out information on how to reach Murshidabad.